Chipping is the most overlooked part of the game yet it doesn’t rely on power or strength or flexibility. Anyone with a brain with half an ounce of brains in it can do it at the same level as the pros. 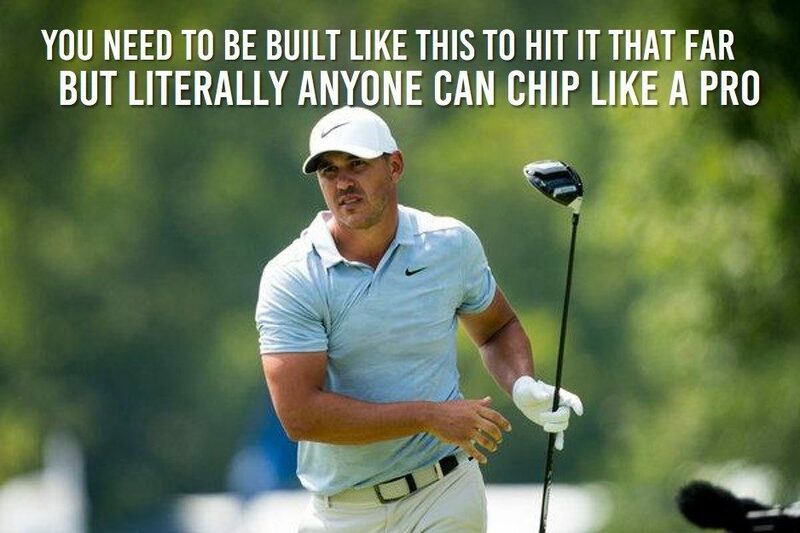 You don’t need Brooks Koepka biceps to chip well and you don’t need to be 6 ft 5 to dunk a chip. So why do so many of us ignore it? Usually it’s ego – most guys just want to hit the big booming drive but don’t realize you need to get stronger physically before you can swing it faster to hit it longer. Lots of guys think it’s boring, but do you think signing for your first 79, 89 or 99 is boring? And that’s how you break your scoring barriers, by shaving strokes around the greens. In fact, I’m going to make a massive claim and tell you that after reading this guide and doing the things in it, you can shave off 5-10 shots within 3 rounds. I understand what you think though. I sucked at the short game for a long time. I thought it was a mystery and fell into the same victimhood trap of watching better players and thinking they can just chip because they were born like that. What a load of horse twaddle! Just read and watch the stuff below and go try it. You’ll be a new man and a lower scoring man in no time. Chicks dig guys with good short games. But Golf Sidekick, Is the Short Game Really THAT Important? I Wanna Hit Driver dude! If you really can’t get the ball off the tee box and you’re leaving more balls short of the ladies’ tee, then you probably need to get that sorted out by visiting a coach or reputable pro. But if you can get the ball airborne in the general direction of the fairway and hit it near the green in two or three shots, I’ll bet the short game is where you can shave off some quick strokes. I’ve played so much golf with mid to high handicappers. Literally 20+ years of it and the one thing in common is usually a shoddy short game. 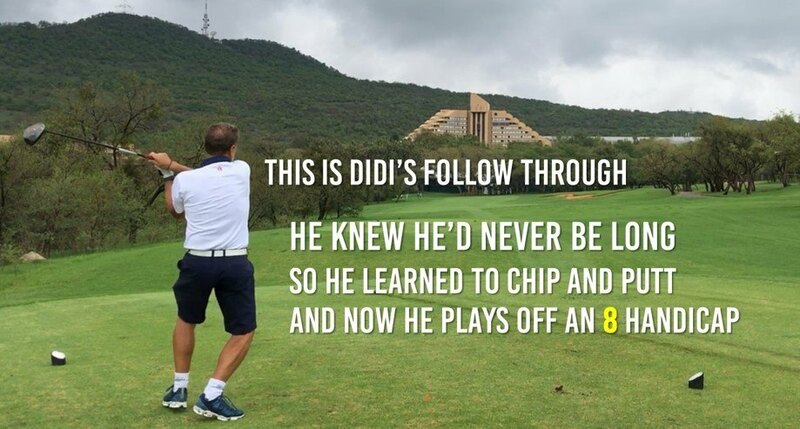 I have a friend, Didi who hits a driver 220 yards off the tee, uses mostly fairway woods to get near the greens and plays off an 8, with one of the craziest swings you’ve ever seen. He can chip and putt like a machine! Next time you play a round; I want you to mark down how many shots you take on each hole inside 50 yards. If you’re green side and getting up and down in two shots 50% of the time, you just need to practice and don’t need to read this article. 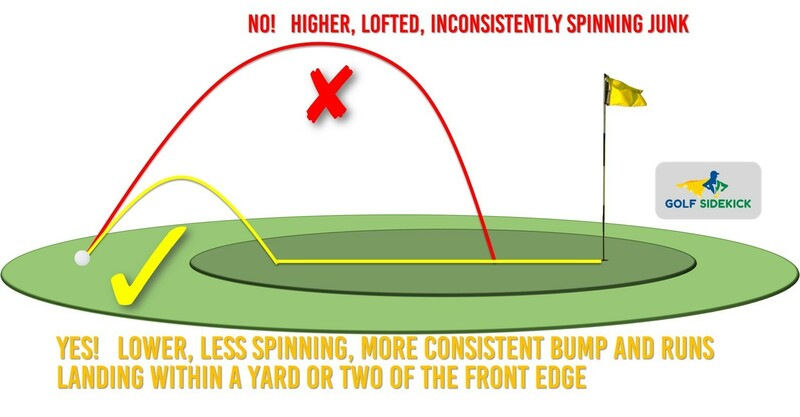 But if you’re taking three or four shots around the green often, this is for you. The basic idea I use for showing you to chip is to simplify the technique and remove all doubt regarding the balls interaction with the ground, so you can make consistent chips with consistent results. 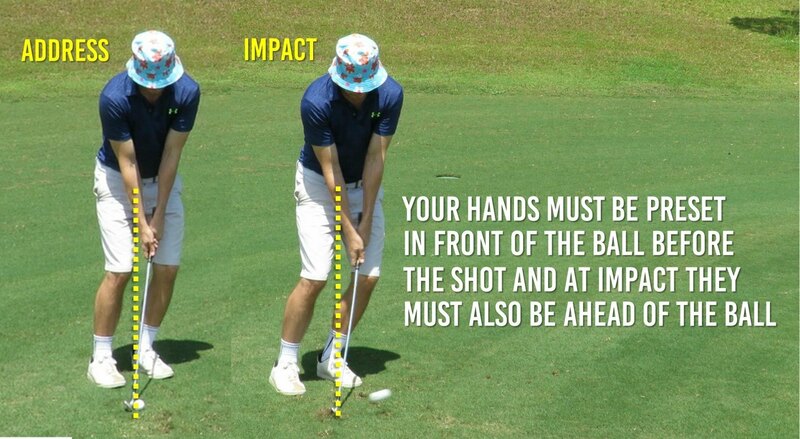 To remove the doubt and fear of how the ball will react to the ground, the GENERAL PREMISE is to GET THE BALL ROLLING on the green as soon as possible. This is achieved by the technique outlines below and is the surest way to avoid those inconsistent results you may be used to. Get it rolling sooner and see more chip-ins and up-n-downs! Lofting the ball too far onto the green with a high loft club is a guaranteed way to get the chipping yips. Doubt, fear, insecurity all creep in because you don’t know if you’re going to leave it short, if it’s going to spin, if you’ll teeth it across the green or duff it 1 foot in front of you. My technique combined with getting the ball rolling ASAP will stop these doubts and fears and make you love chipping. 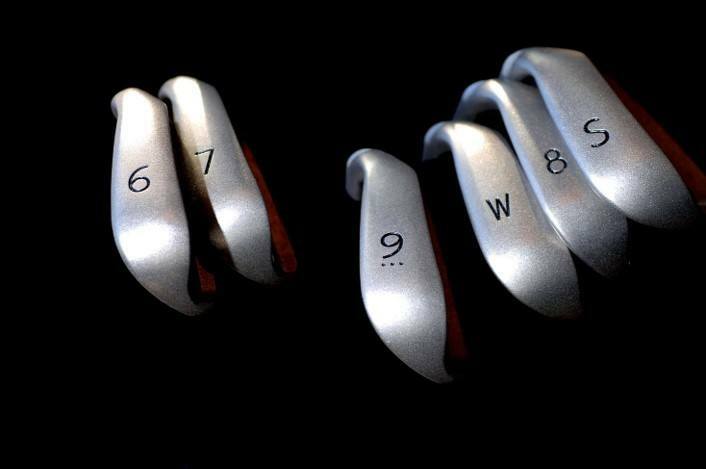 Before we get into the technique, you must select one club to start chipping with. I suggest the Pitching Wedge but you can use a 9 iron, 8 iron, or any wedge just please do not use a 58° or 60° to start with. We will introduce them much later when you’ve mastered the techniques and have confidence. There is one infallible technique to use for chipping. Follow this to the letter and you will go from the skuller, the fluffer and the flipper to the chipping extraordinaire. With full golf shots, we have to rotate our lower bodies from square to the ball to square to the target. With chipping, I want to eliminate that aspect of the swing to make it super simple. 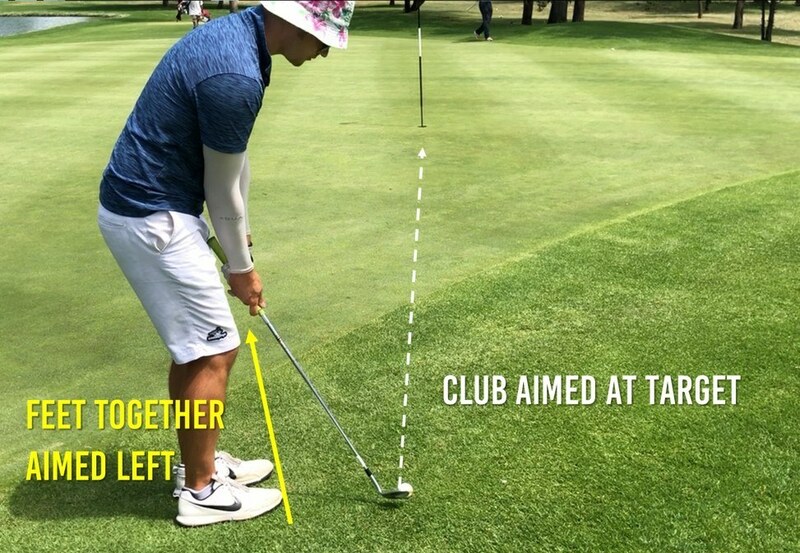 By presetting your lower body open to the target – essentially aiming your feet left of the target line – we make it simple for our body to rotate through the shot automatically. 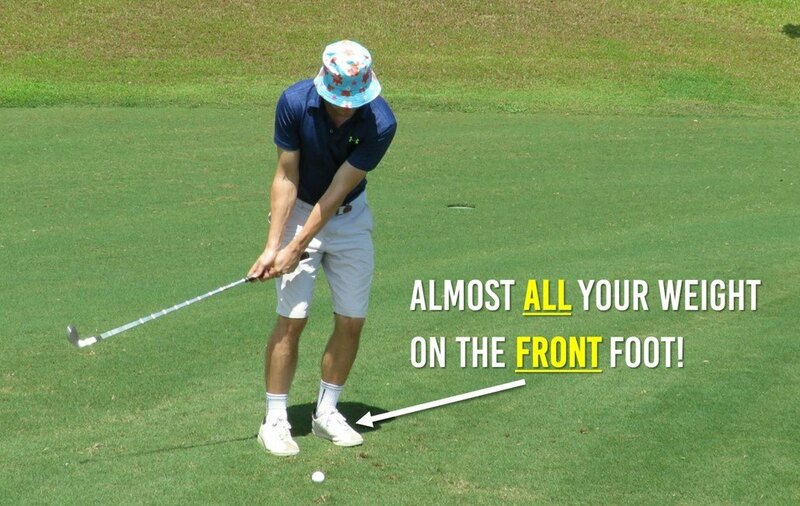 By putting your feet close together, you make sure you have no possibility of falling onto the back foot to scoop the ball in the air (explained more below). I want you to commit to two balls flights only – high or low. I would suggest starting with the back foot as we want to get the ball rolling as soon as possible with my technique. If you find you’re hitting the ball before the earth, you can move it to the front foot. If you play it off the middle of the stance, you’re not committing to a ball flight which is a recipe for disaster as COMMITMENT is the only key to good execution. By setting your hands ahead of the ball, you prevent the temptation of “flipping” the ball in the air by flicking your wrists. This is the death blow for chipping. Any time you scoop with your wrists at the bottom of the swing, you bring shanks, duffs and skulls into play. The consistency is just not there with the scoopy scoop. Wth the hands preset in front of the ball, and a forward shaft lean, you will be preset in a FANTASTIC position to make crisp, clean, consistent chips every time. You must place all your weight on the front foot. In fact, you should be able to chip standing just on your front foot. Why do we do this? This will stop you from falling onto the back foot to try scoop the ball in the air. This is one of the most common things I see in a golfer whose chipping is suspect. A wide stance and the desire to help “lift” the ball into the air while transferring weight to the back foot. This hurts me deep inside but it’s easy to fix! Read the green. Is it uphill, downhill, right to left, left to right? This is exactly the same process as you would do when putting. But I want you to really and truly envision that ball jumping off your club face and take the line you see on the green, all the way to the hole. Now, on that LINE you saw in your mind, find the SPOT on the green you think the ball should land to react the way you think it will react and roll up to the hole. This SPOT is where you want to land the ball. Because you’ve read it, you’ve envisioned it, this SPOT is all you’ll focus on and your only desire in the moment of the chip is to land that ball on that SPOT. 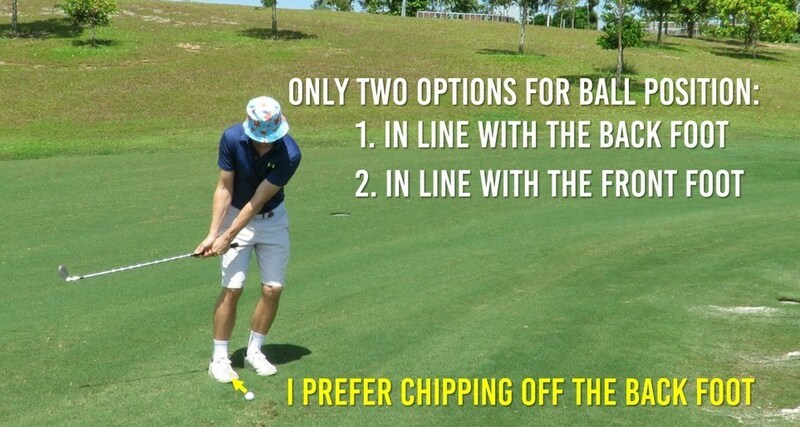 I can’t stress enough how important this is to chipping. At this stage, the hole means literally nothing. You’ve made your plans, you’re happy with the SPOT and you know if you land it on the SPOT, you’ve executed the shot you want. Use your practice swings to gauge your power level to get the ball to land on the SPOT and roll out to the hole. But How Do I Know Where the SPOT Is? Well my good man, you need to practice. But just a little bit. You need to get to a practice green and hit some chips and watch how they react. With experience, this process becomes so easy that you’ll wonder how the hell you were never a chipping maestro before. (Practice section is at the end of the article below). Once you understand how the ball reacts to the slopes, greens and your particular shot profile which is unique to you, then you actually don’t need a green to practice on. You can practice anywhere just hitting a spot. It’s that simple. Once you know how to hit a ball onto a SPOT with the TECHNIQUE described above, chipping is merely a copy paste exercise wherever you are playing. As you get better at chipping with your one single club, you’ll we well grooved in the ability to hit the SPOT. But there comes a time when you may need to use a club with less loft for a longer chip or more loft for a shorter chip. That’s the best part of this system. You use the EXACT SAME swing and power level, just change the club. You still pick a SPOT and then you swing the new club with the same motion you used with your usual chipping club. Let’s say you use a PW most of the time, but now you have a really long chip – something like 25 yards with loads of green to work with. Now you know your pitching wedge is great for this type of chip but only from maybe 15 yards. Those extra ten yards requires you to chip it on too far and you don’t know how it will react with a pitching wedge. So now you find that spot close to the front of the green. Then you pick a lower lofted club like a 9 iron or 8 iron. Swing it the exact same way you would with the pitching wedge and watch it land on your spot and run up to the hole. That’s how easy this is. The opposite is also true. If you have a downhill chip or a short chip, find your spot within a yard of the front of the green and select a higher lofted club. If you use your PW to chip most of the time, use a 52° or 56° club and watch how it doesn’t run out as far as the PW! Here at 3:12 second, you'll see how a subscriber to my Youtube channel learn the secret to chipping along the ground, IN JUST ONE ATTEMPT! There are exceptions to this but in general, mid handicappers and high handicappers should avoid these clubs because they’re much harder to get right with consistency of spin than a PW, 52° or even a 56°. It’s not only the loft but also the bounce of the club and size of the sole that affects the shot. A lob wedge often has less bounce and a thinner sole which means it will dig into the ground. We want something with a larger sole to glide through the turf and make chipping easier to stop chunked and duffed chips from hitting it fat. These clubs also sometimes spin a lot, and sometimes don’t if you aren’t a qualified artist with them. The technique outlined above with a lower lofted club produces balls that spin the same way and roll out the same way every time. I’m a single figure handicap (between 3 and 5) and I have to hit flop shots maybe once every three rounds. The rest of the time, I am hitting bump and runs like I describe in this article. If you find yourself needing to hit flop shots, your course management may need work and in that case, I suggest watching my Youtube videos on the topic, and reading my article on HOW TO MISS A GREEN LIKE A BOSS. The only time you need to hit a flop shot is when you’re short-sided. Instead of covering this fundamental flaw with a band-aid called the flop shot, get to the root of your problem and discover the beautiful world of golf course management strategies. You can find my strategies on my Youtube channel. NOW GO PRACTICE AND GROOVE THE FEELING!!!! BECOME THE PLAYA YOU WERE MEANT TO BE. It's all very well reading this playa, but I urge you to get out to the practice green and start learning. This will take you maximum 10 hours of concentrated practice and grooving to get. 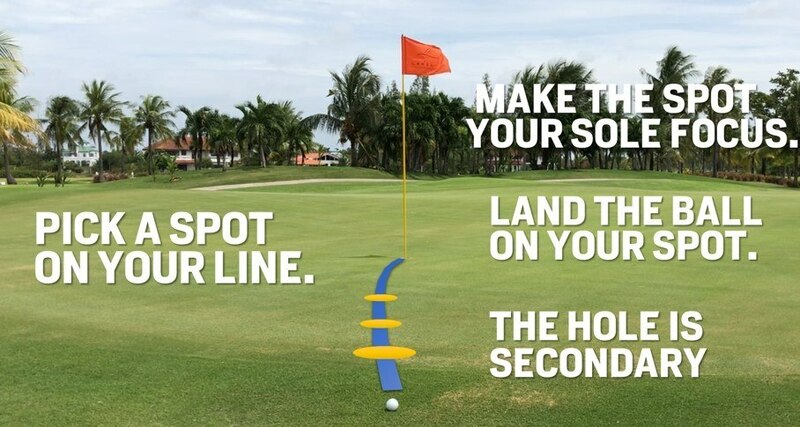 Once you learn these techniques, you will just need to adjust your landing spot depending on the green speed and slopes of the greens wherever you play. I believe everyone can chip like a pro, YOU INCLUDED. No go forth and conquer the hell out of everyone.